A major Peak District-based campaign to help bumblebees launched on Thursday 30 April 2015 with a unique Pollination Conference in Chesterfield and the arrival of a stunning bumblebee wood sculpture at the town’s world-famous Crooked Spire. The three-year Pollinating the Peak initiative – run by Bumblebee Conservation Trust with Chatsworth, Chesterfield Borough Council, HSG UK, Little Green Space, Moors for the Future Partnership and Plain Green – will involve communities in conservation and creating bee habitats, and encourage people to take part in BeeWalk, a national bumblebee recording scheme. If successful, the campaign will be rolled out in other areas of the UK by Bumblebee Conservation Trust, a conservation charity dedicated to securing the future of the country’s bumblebees. “Bumblebees keep us healthy by pollinating our fruit and vegetables, but they’re in trouble. Their populations have crashed, with some species already extinct and others threatened. 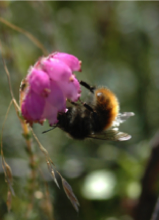 We want to raise awareness about these iconic insects and how we can all help save the sound of summer,” said Gill Perkins, Bumblebee Conservation Trust conservation manager. The all-day Pollination Conference at Chesterfield’s Winding Wheel Theatre – opened by the town’s Mayor, Alexis Diouf – featured interactive workshops, beekeeping and cookery demonstrations, children’s activities, films, and bees working in a ‘bumblearium’. Speakers and guests included former Peak District National Park Authority chief executive Jim Dixon, pollination scientist from Dublin’s Trinity College Erin Jo Tiedeken, writer and entomologist Tim Gardiner, and Bumblebee Conservation Trust chief executive Lucy Rothstein. Acclaimed author William Kirk spoke about gardening for bees and signed copies of his book, Plants for Bees. As a lasting legacy, a stunning oak bumblebee – created by wood sculptor Andrew Frost, who uses chainsaws to transform abandoned trees into works of art, and commissioned by Chesterfield Borough Council – was formally unveiled in the churchyard of St Mary’s Church. “We’re delighted to host this pioneering conference. 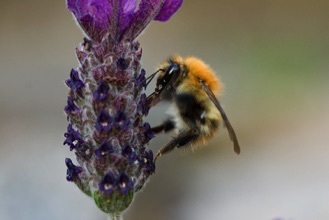 One in three mouthfuls of our food are thanks to bees, and we can take action to help them – including by managing gardens and land in a pollinator-friendly way,” said Peter Corke, sustainability officer at Chesterfield Borough Council. UK bumblebee populations have crashed over recent decades due to pressures including climate change, pathogens, increased use and toxicity of pesticides, and habitat loss. Since the Second World War, more than three million hectares – 98 per cent – of lowland meadow have been converted to intensive agriculture and urban development, or have simply been neglected. Of the UK’s 24 bumblebee species, two – Short-haired bumblebee and Cullum’s bumblebee – have become nationally extinct in the last 80 years, although the former is being reintroduced after an absence of 25 years. Seven species are in decline, and 11 are of conservation importance. For information about the Pollinating the Peak partners: Bumblebee Conservation Trust www.bumblebeeconservation.org; Chatsworth www.chatsworth.org; Chesterfield Borough Council www.chesterfield.gov.uk; Communications & Campaigns International www.richardbunting.com; HSG UK http://hsguk.com; Little Green Space www.littlegreenspace.org.uk; Moors for the Future Partnership www.moorsforthefuture.org.uk.